Do you actually like jelly babies? TB: I hate jelly babies but at the time it was such a joke. And a joke that worked, you work it to death and finally you grow to hate it. There were liquorice allsorts in some of the episodes. TB: Well, sometimes I used to get very mixed up in the script and I didn’t know a jelly baby from a liquorice allsort. TB: [ADDRESSING THE OTHER ACTORS] They’re a bit shy. Colin Baker: We were waiting outside we didn’t know it had started. 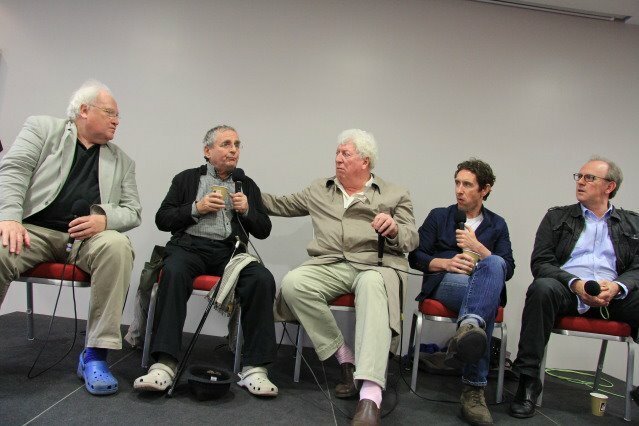 Paul McGann: They’re all looking at us through lenses. People just don’t use their eyes anymore. Is this the first time you’ve all been together on stage? Have you actually met each other before? TB: We had a photographing session together, that was epic. TB: What did he keep saying? Kiss me, sir, next. TB: Sometimes I meet lovely fans who are feeling quite affectionate and I respond to affection like the next dog. I pull my arm back and starting reading a palm because I like reading palms, and they say to me ‘get a move on, Tom’. So the fans don’t get a chance to know us. TB: They don’t get a chance. It’s terribly sad. I think they should do it for twice the money and a quarter of the numbers. CB: Or ten times the money and a tenth of the numbers. TB: Ten times the money and we could do it on Skype. We’ve heard that Tom would be interested in coming back for the 50th anniversary, would the rest of you? SM: Oh, all the fans will hate you. CB: I think hate is a powerful emotion. Get some hate going and when you’re somebody nice, a little bit nice, they like you again. TB: I think it would depend. I said I’m not automatically in, if the BBC ring me up, naturally of course I get very suspicious. Even if you say ‘BBC’, I think ‘allo, ‘allo dodgy. But if they ring me up and ask me if I want to take part, I would want to know what they would want me to do. What did you think of the Doctor’s outfits? TB: What do you mean? I just wore my ordinary clothes – that’s how I got the part. I just turned up – he’s got his own costume. CB: I got the part because of the hat. I went to the BBC, it was a sunny day, one of the very few. I went along to see the producer and he said ‘ooo…I’d like that hat in Doctor Who’. Well, I said ‘I go with the hat’ and got the job. PM: Did anyone else get a say in your costume? CB: Well, I was asked what kind of costume I wanted and the description I gave was almost exactly what Christopher Eccleston ended up wearing. It struck me that someone who wants to pass unnoticed and achieve the odd thing here and there wouldn’t go around drawing attention to himself, so the darker the better. And they said that’s a very good idea, however… they produced my costume. The only joy about that is that I was on the inside looking out and the rest of you had to put up with it. It was the Eighties, glam rock. PD: Well, your outfit, it’s sort of bizarre, like my costume on acid, really isn’t it? I like the idea that the Doctor just goes into this room and picks out certain items of clothing, so I didn’t really like my outfit very much from that point of view because it was designed. I didn’t look like someone who had just gone in and picked up this, picked up that. Colin experienced my costume on drugs. [TO SYLVESTER] Yours looked quite shambolic, didn’t it? In a nice kind of jumbled up way. PD: Yes, those question marks, it was too self-referential. I didn’t understand the question marks. PM: But was it negotiable? CB: But why does the Doctor have to wear a costume? Why can’t he wear clothes? Why is it a costume because they are all costumes, aren’t they? PD: I think it was in our case John Nathan Turner and let’s make a big impact and publicity. What do you think is the enduring appeal of Doctor Who? CB: If we could answer that, we would go away and make it ourselves or a variety of it. The fact that it has endured is part of its enduring appeal. Timing, isn’t it? And cowboy films fell out of favour, we all loved cowboy films, who is that masked stranger? The man who comes into town, sorts out the problems, goes. We couldn’t do that in England. So you’ve got to come up with something else. He’s the Lone Ranger. TB: We are pre-disposed for fantasy, there is a natural impulse for human beings to want to get off their heads or out of their heads in something in a substance or a drink or an idea or a religion which will comfort them and make life exciting. Therefore, what you see on the television is nothing compared to the other things people believe in. I think people can believe in anything. Peter, what’s it like to have the Doctor as your son-in-law? PD: I’m waiting for him to call me dad. He hasn’t called me dad yet. Do you debate which is better, the old series or the new series? PD: No, we never do. You see David [Tennant] was this huge fan of the old, classic series because that’s what he grew up on, as did Russell T. Davies and Steven Moffat. They know an infinite amount, massive amount of details that we couldn’t answer about the classic series. So, we don’t ever sit down and discuss it, we hardly talk about it actually. I do debate with my grandson because I said ‘who’s your favourite Doctor?’ and he said ‘David Tennant’ and I said ‘who’s your second favourite Doctor?’ and he said ‘Tom Baker’. So I said: ‘who’s your third favourite Doctor?’ and he thought about it and said ‘I haven’t got a third favourite’. I’ve managed to force and intimidate him into going slightly up the table there. Depending how nice I am to him, I get above Tom for a few weeks and then fall down again. When you regenerated, were on the set with your predecessor/successor? CB: I was present when Peter regenerated into me and we went up to the bar afterwards and there was a party and I said to you – it was a polite question to ask: ‘have you got any advice?’ And he thought for a minute and went ‘no’. PD: I’d just been traumatised by regeneration, my great acting starring Nicola Bryant’s cleavage! SM: Well, no one turned up for my regeneration. I didn’t even get bought a drink and I didn’t get any advice. I had to do it myself. PD: And look what happened to you. SM: I ended up killing off the programme for a while. Yes, I managed to close it and then Paul gainfully came along later and tried to revive it. That was interesting. I feel bad for Colin Baker really, in the Big Finish episodes hes brilliant.